San Francisco for Halloween–Shrimp Boy or Ed Lee? If you had a choice, who would you rather be–longtime criminal Raymond “Shrimp Boy” Chow or San Francisco Mayor Ed Lee? Not just for one devilish day on Halloween, but in real life. 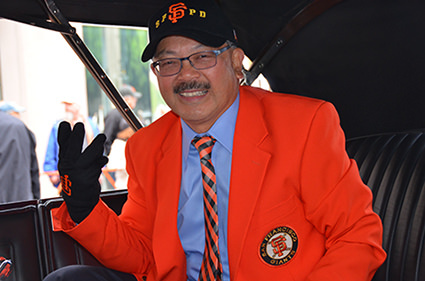 If you need help, here’s Ed Lee in Giants drag last year in San Francisco’s World Series parade. This year, the New York Mets, not the Giants, are in the World Series, so maybe Ed’s dressed all in black instead. And here’s Shrimp Boy, who recently got the [New York Times Magazine](https://www.nytimes.com/2015/10/18/magazine/shrimp-boys-day-in-court.html?r=0)_ treatment that might look like an inexpensive Halloween outfit. Tank top, shaved head, tats. Cool. Sure, the question is a no-brainer. Preposterous, right? Of course, you’d want to be Ed Lee. Because he’s the mayor of San Francisco. Not Shrimp Boy, the guy with the rap sheet as long as the longest noodle in your birthday soup. Still, it’s an important question, not just for Halloween but as an overall matter of justice. The issue will be raised at Chow’s trial in San Francisco, where jury selection begins on Nov. 2. The charges against Chow include murder in aid of racketeering and money laundering. Chow has been accused of killing Allen Leung, his predecessor in the Ghee Kung Tong, and being implicated in the killing of another rival tong leader, Jim Tat Kong. Chow recently pleaded not guilty to the murder charges. The judge combined all the charges last week when federal prosecutors decided not to seek the death penalty. As you may recall, Chow was part of a major FBI undercover investigation last year that ultimately forced California state senator and Asian American community leader Leland Yee to resign. Among the myriad issues raised was Yee’s friendship with Chow and the trade of a senate resolution that honored Chow in exchange for campaign cash. In July, Yee acknowledged all of that, as well as other bribes and the brokering of a weapons deal with Philippine nationals. He accepted a plea arrangement that could still get him 6-10 years in federal prison. Right now, you don’t want to be Leland Yee for Halloween, or real life. Yee and others caught in the sting have cleared the way for Chow’s legal star turn. But Chow’s defense boils down to other people not being named in the sting. Chow is claiming selective enforcement of the law. Chow says he’s not the convicted ex-pimp and thug of old. He says he’s a reformed ex-con leading his Ghee Kung Tong, or CKT, back to respectability as an organization that does good for the community. His lawyers, led by the legendary defense attorney J. Tony Serra, say selective prosecution is at play since others implicated in the investigation, including Mayor Ed Lee, have avoided indictment. According to news reports, two Human Rights Commission officials affiliated with Lee’s 2011 election campaign were caught in wiretapped conversations describing how to avoid campaign finance laws by breaking up $10,000 donations into small amounts given by straw donors. One of the officials said Lee was aware of the scheme. Lee has denied any wrongdoing. That’s why it’s better to be Ed Lee, at least for now. And not the tattooed Shrimp Boy Chow. The Lee political costume is still working like a charm. Shrimp Boy still looks like an ex-con Tong boss. But if Chow’s defense lawyers are right, who knows if Lee will be another Yee? Maybe it’s better to be the bad guy trying to be good, instead of the good respectable guy who reveals another side behind the mask. That’s one thing the New York Times Magazine article did: humanize Chow in a way few media outlets have in the past. Many have fallen in love with the crustacean nickname. But few have bothered to flesh out the image of the Asian bad boy, preferring to leave him as a semi-comic bad dude with the amusing nickname. Sort of the Asian Baby Face Nelson. You may recall the historic _Times _mea culpa in the Wen Ho Lee case. Not only did the Times rely too heavily on government sources in reporting on Lee’s case, it made him appear like a shadowy foreign spy instead of a real human being. The Times story on Chow, based on prison interviews and personal conversations, describes how Chow just wants to be a regular guy on the outside. How he falls in love with an Asian American woman from the burbs and tries to reform. How he uses too much toilet paper when suffering from anxiety. The reporter, Elizabeth Weil, talks about his shiny head and soft hands. And how Kwok Cheung Chow, born in Hong Kong, gets tagged by his grandma who called him Ha Jai, or Shrimp Boy. He was lucky grandma didn’t like tofu. But life really goes downhill when he was eight and his father loses the family barbershop due to gambling debts. Shrimp Boy, four brothers, parents, and grandmother moved to a one-room shack with no running water and just two beds, according to the story. Seeking comfort, Shrimp Boy tried to get in bed with his grandmother whenever he could. But by age nine, he got into fights, including one with a knife where he drew blood from his victim. By 16 when he came to San Francisco, he was already an accomplished hood. Instead of high school, he had a letter of recommendation from a Hong Kong gang member to a Chinatown tong. A life of crime was assured. The piece also talks about how in this last sting, he was double-crossed by the feds, who put him out there, like his nickname implies, as bait to attract other nefarious characters. And he did. But not everyone was indicted, and now only the Shrimp Boy remains. Normally, it’s not a great defense to say, “What about the other guys?” But the Times article is probably all defense attorney Serra had hoped for, as the trial starts up this week. If you had no idea about Shrimp Boy, hearing the story of his life–as a human being and not a cliche Asian gangster–would probably make you stop and ask if Shrimp Boy, on the road to recovery, had been set up to fail. It may be all the doubt Serra needs to muster to get the Shrimp Boy off the hook.